Let Ancona chef series bring the high standards of professional range hoods to your home. Made with commercial grade stainless steel, the model combines power and elegance featuring stainless steel baffle filters, 4-speed electronic controls and led lights. Ancona's professional design delivers quiet yet powerful ventilation and easy-clean convenience. 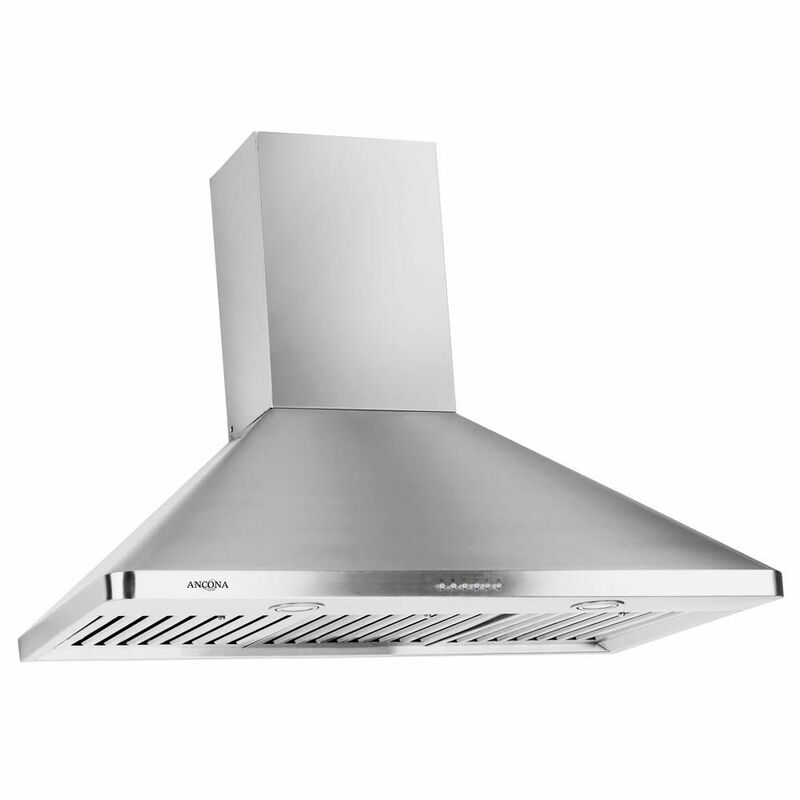 Modernize your kitchen with the Ancona GCT436 range hood. The state of the art 3-speed electronic touch controls with time-delay shut-off allows you to choose the precise speed at the minimum noise level. The long lasting, high output LED lights are an eco-friendly way to brighten your cooking surface, and the sleek stainless steel baffle filters will maintain their luster even after many washes keeping your range hood looking as beautiful as the day you bought it. Made from the high quality 430 stainless steel and tempered glass, the Ancona GCT436 combines elegance, durability, and features ready to fit today's modern lifestyle! WPC 636 Wall Chef 36 inch Range hood with LED lights Let Ancona chef series bring the high standards of professional range hoods to your home. Made with commercial grade stainless steel, the model combines power and elegance featuring stainless steel baffle filters, 4-speed electronic controls and led lights. Ancona's professional design delivers quiet yet powerful ventilation and easy-clean convenience. WPC 636 Wall Chef 36 inch Range hood with LED lights is rated 5.0 out of 5 by 2. Rated 5 out of 5 by Glynda from GREAT PRODUCT!... GREAT PRODUCT!